When the cast and crew of The Walking Dead debuted a sneak peek of their season 7 premiere at New York Comic Con a few weeks ago, I was fortunate enough to be in the audience. As the crowd sat watching the clip, I could feel it in the air: this episode was going to be a heavy one. And on Sunday night, that was proven to be true when we lost not one, but two members from our group of survivors: Abraham and Glenn. However, Rick’s response doesn’t fly with Negan. He taunts Rick and has his “right-hand man,” Simon, pass him the weapon that was found on Rick’s person: an axe. He belts the axe and drags Rick from the line-up, claiming that his behavior will determine the fate of the remaining members of the group. He throws Rick inside the RV, and the camera pans to reveal the smashed-in, bloody remains of a skull. Inside the RV, Negan taunts Rick for threatening to kill him after what he just witnessed in the line-up. “Your best chance is to stand up, grab that axe, and drive it through the back of my head.” he says. Negan’s words continue to dare Rick to grab the axe and, just as he does, Negan whips around from the wheel, gun in hand. Rick drops the axe on Negan’s command, and he punches Rick in the stomach. As dawn is breaking, Negan tells Rick, “I want you to think about what could have happened, think about what happened, and think about what can still happen.” And so he does. Negan starts the RV and drives into the fog ahead, and Rick begins to see the faces of his group from the line-up: first Rosita, then Glenn. Now, Rick is laying on top of the van, and we go from a close-up of his eyes to a flashback of the line-up from the night before. However, we now see things from his perspective rather than from Negan’s. As Rick looks from side to side at his fellow survivors, we see Negan begin his familiar game of “eenie, meenie, miney, mo.” Rick follows Negan with his eyes, blurred and shaky, in an attempt to process what is happening around him. As we hear Negan say, “You are it.” Lucille lands on his first victim: Abraham. Abe rises up to meet Negan, and we see him give Sasha the peace sign – a symbol between them from previous seasons that allows the audience to realize that he is communicating with her one last time. Sasha begins to cry, and the bat comes down on Abe’s head. As he rises and Negan proclaims that he is “taking it like a champ,” Abraham delivers his final words: “S*** my n***.” The bat comes down again, and we cut to close-ups of Rosita and then Eugene, both shocked and crying. We continue to see shots of our group crying and broken as Negan finishes with Abe. Excited by his kill, Negan whips Lucille around, splattering Rick in the face with blood. Realizing that Rosita and Abraham were romantically involved in the past, he shoves the bat into her face and taunts her. Daryl, unable to take any more of this, springs to his feet and hits Negan in the face, only to be tackled to the ground by several Saviors. 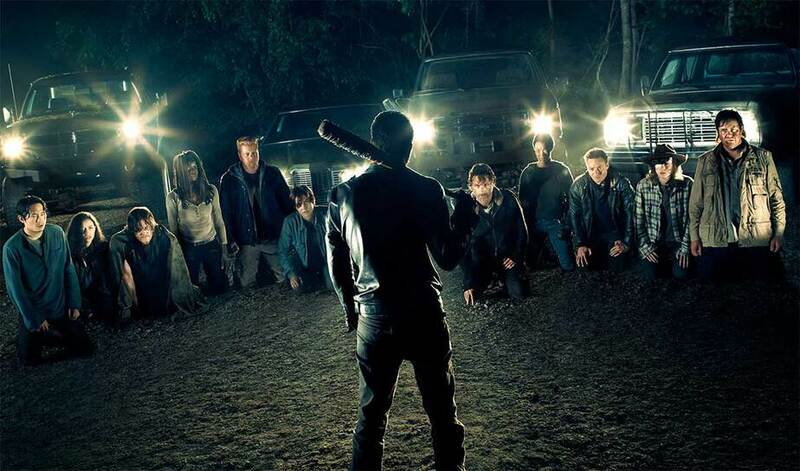 Negan is angered by this second outburst (the first having been from Glenn in the season 6 finale), and he tells the visibly terrified group that this behavior is unacceptable. Dwight offers to kill Daryl…but Negan declines, and Daryl is dragged back off to the side. Negan relates to the group that he is a man of his word and reminds them that even though the first outburst was “free,” the second will not go unpunished. Almost immediately, he raises Lucille again, and the bat lands on the second victim of the evening: Glenn. As a sobbing Maggie looks on, Glenn is able to force out one final phrase to her: “Maggie, I’ll find you.” The group is hysterical, and Negan mockingly apologizes to them – but these are the rules, and he continues on with his second kill. We see the faces of the different survivors reacting: a shocked and guilty Daryl, a sobbing Maggie, an angry Carl, and so on. We continue to see their reactions, along with Negan’s killing of Glenn, as he brings in the “joke” from the opening of the episode: “Lucille is thirsty – she is a vampire bat!” Not cool, Negan. We are brought back to Rick in present-time, still lying on the RV, being prompted by Negan to bring him the axe as walkers surround them below. Negan fires some shots through the roof as Rick grabs the axe, runs, and jumps off, clinging to the man-turned-walker’s hanging body. Walkers surround Rick below and grab at his legs as the body of the one he clings to begins to break from its neck – but just as he is about to fall to his doom, Negan shoots out the surrounding walkers in the nick of time. “Clock is ticking, Rick,” he says. “Think about what can still happen.” And Rick fights his way through the remaining walkers, picturing the deaths of the remaining members of the group one by one. 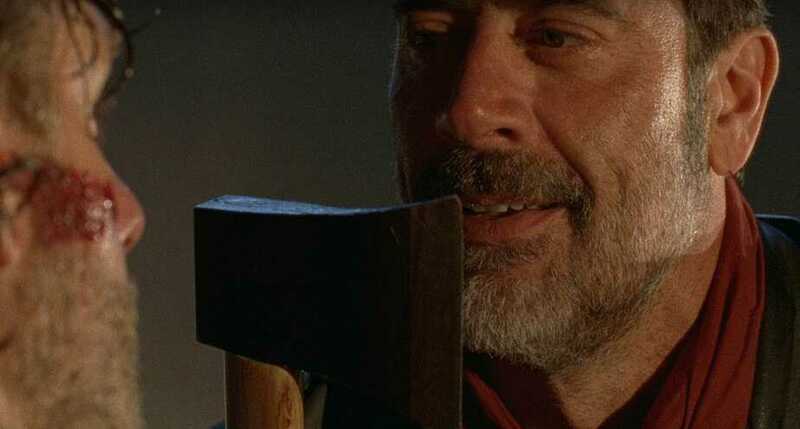 Finally, he makes it back to the RV with the axe, handing it over to a pleased Negan. Negan starts the RV again and drives them back to the scene of the line-up. Once parked, Negan taunts Rick about losing leadership over the group to him. He sterilizes the axe, bloody from the fight with the walkers, and forces Rick to take it. Fed up with Rick’s lack of decision-making, Negan begins to count down from three. Hysterical and begging, Rick still can’t seem to make a final decision – that is, until Carl looks him in the eyes and says, “Dad, just do it.” As Rick raises the axe to cut off Carl’s arm, Negan kneels next to him, stopping it from happening. Rick is finally fully under Negan’s control, and Negan is satisfied. Knowing that the group now understands, he proclaims, “Whatever you had going for you? That is over now.” He takes Daryl prisoner in an attempt to keep the group in line, threatening to harm him – or, to force Rick to harm him – if they do not obey. He promises to be back in a week to retrieve the group’s first “offering,” and he and the Saviors take off. Our group is finally left alone together for the first time since the previous night. As they begin to process the severity of what has happened and mourn those that they lost the night before, Maggie, sick and pregnant, rises and heads towards Glenn’s body. She refuses the group’s help, claiming that they need to leave and get ready to fight the Saviors. Though Rick reminds her that the Saviors have Daryl and an army, Maggie still refuses their help – she can get to the Hilltop Colony on her own, and it is implied that she doesn’t want them risking their lives for her anymore. Knowing that Maggie is in shock, Sasha offers to take her to Hilltop and keep her safe – and Maggie accepts. As the group assists each other to bury their loved ones’ bodies, we hear the same voice-over from Negan that Rick heard from outside the RV: “Bet you thought you were all gonna grow old together. Sittin’ around the table at Sunday dinner…” We cut away to a vision of the entire group, happily enjoying a meal together, with Abraham sitting at the end of the table with Sasha, and Glenn sitting with Maggie and their future son. Back in reality, Rick grabs the axe off of the ground and drives away from the scene. A walker approaches, attracted to the blood stains on the ground, and we are left with a close-up of Rick’s terrified and broken face as the screen cuts to black. So far, the fan reaction to the premiere has been mixed. 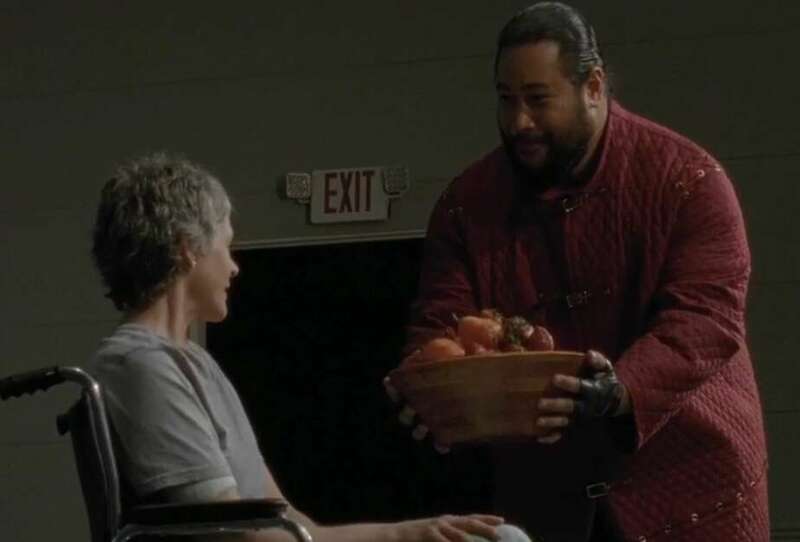 After surveying several members of the FoCC forum, it was found that while many of our viewers expected Glenn in particular to be one of the recipients of Lucille, some were disappointed by the fact that it came after the dumpster incident from last season, feeling that it gave his death less meaning and indicating that the death might have better served the story if it had been given to another major character. And while some FoCC members were left in awe by the raw emotion of the episode and cannot wait to see what happens next, many others were left unsatisfied with the premiere and are not sure if they want to continue watching the series. Personally, I feel that this episode was tragic and heartbreaking… but at the same time I think it was very intelligent and carefully crafted. The fact that we get a full picture of Rick’s psychology and are told what has happened through his point of view is only fitting – after all, since season 1, this has always been Rick’s story. And while Abraham and Glenn were not the most shocking choices to die (Glenn’s fate is similar in the comics, and Abraham definitely posed a threat to Negan by standing up to him – not to mention the fact that he is also killed by the Saviors in the comics, though the on-screen counterpart was given to Dr. Denise in season 6), both deaths were brutal and pushed the limits of what is normally expected from The Walking Dead. I am still in mourning for these characters days after the episode aired, which is a true testament to how well rounded the character development is on this show. To me, they feel like family, and I will miss them both dearly as I look to the coming weeks to see how our group of survivors will deal with their loss. Click here to join The Walking Dead conversation on the FoCC forum. Melanie (Mlgagne) is a lover of pop culture and the entertainment industry. She is a passionate fan of various TV shows and films, including (but certainly not limited to) GAME OF THRONES, THE WALKING DEAD, PREACHER, OUTLANDER, and X-MEN. She is a regular attendee of San Diego Comic Con (SDCC) and New York Comic Con (NYCC), and she plans to add WonderCon, Con of Thrones, and Walker Stalker Con: Atlanta to her repertoire in 2017. When she is not watching/discussing her favorite fandoms or planning for her next con, she can likely be found sharing cute animal photos on various social media outlets. You can follow her on both Twitter and Instagram @mlgagne.